Phat Brats is the newest gourmet sausage darling taking Melbourne by storm, trying to satisfy Melbourne’s insatiable appetite for gourmet sausage. 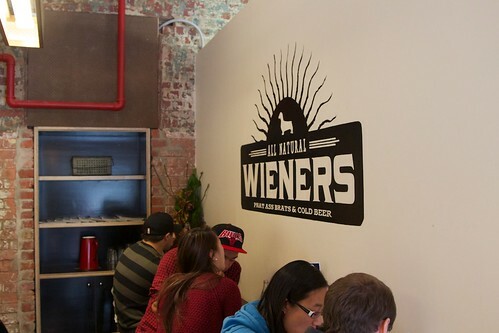 Sausage-wise, there’s the tried and true Victoria Market Deli Hall, the Sydney upstart Snag Stand, and the well dressed guys from Massive Wieners. A veritable sausage fest. 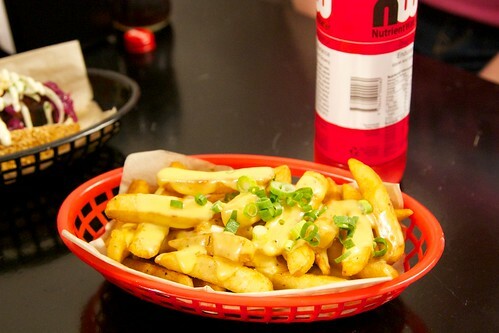 Located on Brunswick street, near Johnston St, Phat Brats is nestled amongst a bunch of eateries that predominately cater for the after 3am crowd. I was a little surprised making the trek out here on a Monday afternoon with not a beer bottle in sight. The interior is functional, with the most prominent feature being the giant menu which should be legible for even the most inebriated patron or shortsighted girlfriend without glasses [Marg edit: Hey! I remember to wear my glasses sometimes! Also, I'm sorry for making you read menus out to me all the time]. Apart from my dining companions arriving 30 minutes late to lunch in their own suburb (not related to the establishment), and some of the orders going missing (related to the establishment), I really enjoyed Phat Brats. The cheesy fries were outrageously good, as was the wagyu beef sausage I had; it just turned into a decadent taste frenzy. If you’re not reading this at Phat Brats, with an actual sausage in your mouth, you’re wasting your time. Go. Now. 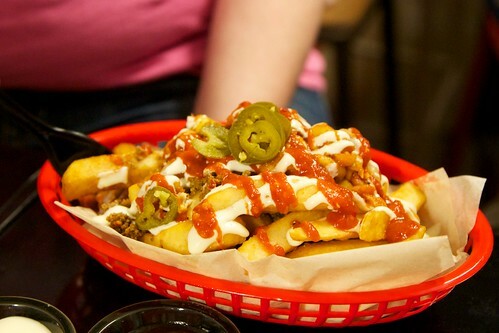 Note: The chilli fries, although delicious, where too hot for everyone at the table. You’ve been warned. 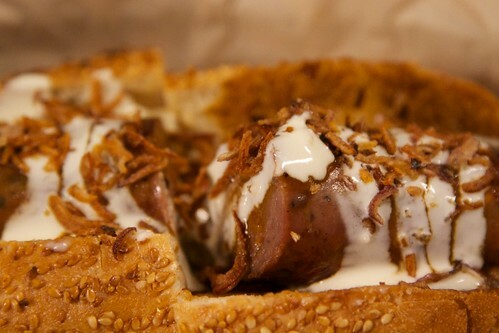 File this one under ‘Melbourne food trend #37 – Dude food (gourmet hotdog division)’. Phat Brats is the latest purveyor of fine hot dogs to open up in Melbourne (see also Snag Stand and Massive Wieners), and in my opinion is the best so far. The slightly retro-styled cafe on Brunswick Street has a really nice atmosphere and plenty of seats – exposed brick, high stools, vintage-look signs, it’s a pretty common theme in a lot of new Melbourne cafes at the moment but it’s very well done here. Phat Brats is also obviously pretty popular, when we were there on easter Monday it was packed (getting dirty looks from the waitress while waiting for our friends and taking up a table for 4 type packed). Imagine how busy it must be when 90% of Melbourne isn’t away on holiday! 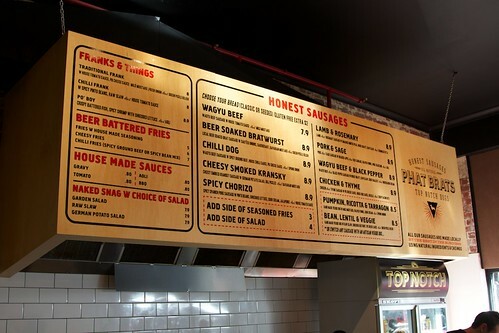 On a random note, a number of the signs around Phat Brats described the sausages as ’honest’. The use of the word ‘honest’ to describe food is something that I’ve seen coming up more and more since I first discovered Charlie’s ‘honest lemonade’ a couple years ago. I’m kind of stuck in a love/hate relationship with it. I hate it because saying that food is honest means literally nothing and is basically just a way to make something sound good without having to say that it’s organic or sustainable (things that actually have meaning and so claims you might actually have to back up). It’s like saying that ice cream or a drink is blue flavoured, blue is not a flavour people! I actually scream whenever I see that (luckily I don’t see it as often as I used to, maybe I’m just not shopping in the cordial isle of Coles as often though). Anyway, at the same time I love the use of ‘honest’ to describe food because it evokes images of being old-fashioned and down-to-earth, it’s the sort of marketing that I think is just the right level of douchey. Does that makes me the target market? Excuse me while I go hang my head in shame. Choice of marketing words aside (and trust me, we should put them aside because I am nothing if no pedantic about these things, I should also take this chance to apologise to anyone who has ever had to sit through my rant about those old TAC ads with the ‘arrive alive’ catchphrase, if you die on the way somewhere you won’t arrive at all, the alive is redundant!). Check out the hotdogs below, they were awesome. Not alive, but delicious. There are 11 sausages on the menu with 2 vegetarian options (a pumpkin, ricotta & tarragon and a bean, lentil & veggie – both $8.50). 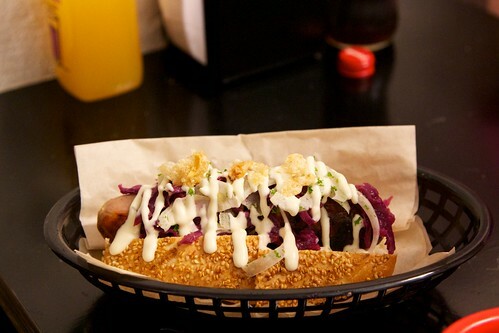 I had the pork & sage sausage with apple, red cabbage, fennel, pork crackling and aioli ($8.90). It was delicious, the name does not lie, this is one fat sausage. Toppings were great too, just enough freshness to balance out the big hunk of meat. Gerard had the wagyu beef & black pepper sausage with gravy, crisp shallots and horseradish cream ($8.90) which he really enjoyed. One of our friends also had the wagyu beef, the other went for the chicken & thyme sausage with cheese, BBQ sauce and crispy bacon ($8.90) which looked pretty darn good. Gerard and I also shared a serve of the cheese fries with gravy ($6 for the chips, $0.80 for the gravy). These were seriously good, judging on chips alone I would probably take the Snag Stand equivalent over these, but with the added joy of cheese and gravy, these made my day. Friends K & A tried the chilli fries ($7). When I say K & A tried them I mean that we all tried them and ended up giving up because they were seriously hot. I expect a little heat in a chilli, but these went above and beyond (not necessarily a bad thing, just something to be aware of). 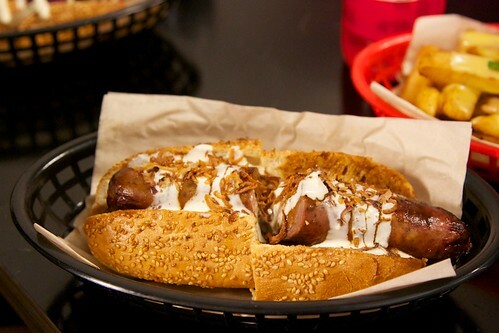 Phat Brats, the new kid of the Melbourne gourmet hotdog scene, is delicious and has a hotdog for all occasions. Check it out.